Covering all Pacific islands involved in World War II military operations, this book is a detailed, single source of information on virtually every geo-military aspect of the Pacific Theater. Arranged regionally and, to the extent possible, chronologically according to when islands entered the war, entries provide complete background information. Along with island names, nicknames, Allied code names, location, and wartime time zones, the entries include such topics as the island's physical characteristics, weather, health hazards, historical background, native population, natural resources, and military value. Japanese and Allied strategies and operations, military problems caused by terrain, military installations, Japanese units and key commanders, Allied units and key commanders, and brief battle descriptions are also covered along with the island's postwar status. 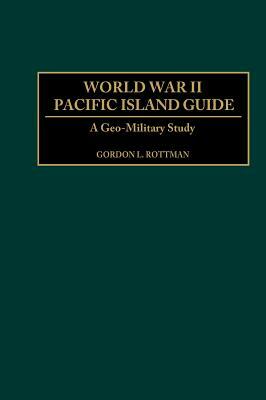 A valuable resource for researchers, historians, military history enthusiasts, and war gamers, the book provides complete background information on the geo-military aspects of the Pacific Ocean region, its islands, and the roles they played in the war. 108 maps provide specific information. Until now, geo-military information could only be found by searching four to ten publications on each island. GORDON L. ROTTMAN has served 26 years in the U.S. Army in Special Forces, airborne infantry, long-range reconnaissance patrol, and military intelligence assignments in the Regular Army, Army National Guard, and Army Reserve. He began writing military history books in 1984. He is employed by TRW System and Information Technology Group as a special operations forces scenario writer at the Army's Joint Readiness Training Center, Fort Polk, Louisiana.